ST. PETERSBURG, Russia (AP) Egypt arrived in Russia with Mohamed Salah and some high expectations. Salah was hurt last month in the Champions League final. He dressed for the opening match, but sat on the bench as Egypt held Uruguay scoreless for 89 minutes. Eventually, however, Uruguay scored and won. Salah started the second match against Russia and even scored from the penalty spot, but the host nation also proved to be too much. Those two losses combined with wins for both Russia and Uruguay over Saudi Arabia confirmed the team’s elimination despite one final Group A match on Monday. Most of the expectation, and pretty much all of the hype, had been placed on the shoulders of the 26-year-old Salah, who scored 44 goals in 51 games for Liverpool and was named Premier League player of the year. But he clearly lacked match fitness in his World Cup debut, only showing a few glimpses of the speed and marksmanship he has displayed over the last year. Still, he was by far the most dangerous of Egypt’s forward trio even if he was missing the kind of service he normally receives at Liverpool. 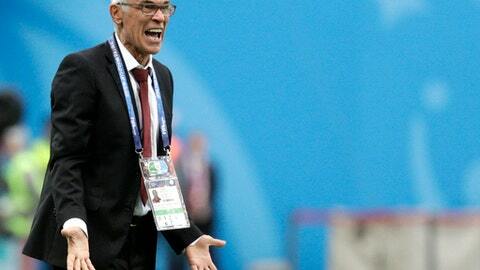 Cuper said Salah had not undergone the intense training his teammates had in the three weeks prior to the World Cup. He missed warm-up matches against Kuwait, Colombia and Belgium. Salah apart, Egypt typically gave the ball away too easily, didn’t threaten and made defensive blunders that belied the solid reputation of a back four led by West Bromwich Albion defender Ahmed Hegazy. Egypt’s run to the World Cup, and the sensational exploits of Salah in both the shirt of the national team and Liverpool, raised the level of soccer madness back at home recently. The results in Russia have divided the millions of fans in Egypt who have been captivated by the squad since qualification in October, with one side being harshly critical while others resign themselves to the limitations of the team. News of the loss to Russia made the front page of every Cairo daily, but the tone varied. But the independent Al-Shorouk said the team was ”clinically” out of the tournament. Sports commentators and social media users, whose views are often more reflective of the mood on the streets, blamed Cuper’s tactics, his selection of players and a large group of wealthy businessmen, actors and TV personalities who they accuse of distracting the players the day before the game against Russia by staying at the team’s hotel in St. Petersburg.